It was in a chapter called "Diseases of Feast," which talked about the history of food shortages and the problems that have arisen as a result of social and technological progress. The book was published several years before I was born, but now, over a quarter of a century later, it's all still so valid. The key, I think, is that this book isn't a fad diet book. It's the science behind weight loss, which doesn't make any promises for losing X number of pounds in a week by drinking only this special shake and doing a particular exercise. ... there is only one remedy for excess weight: a low-calorie diet combined with exercise. This combination, by supplying less energy-producing food than the body uses, reverses the process by which the fat was acquired in the first place. For once the body has used the energy that has been made available by eating, it will then turn to its fat storehouse, making gradual withdrawals until all of the excess has been burned off and body weight has again been returned to normal. Some of the terminology is interesting, but all in all, it gave me a lot to think about. Mainly with strengthening my willpower muscle to get back on track and push forward towards my goals, but also, with thinking about how to eventually maintain a healthy weight. So, in the midst of my failed month of non-weighing, I found myself in Target yesterday contemplating buying a second scale. Not for my body though - for my food. In both arenas, I need this kind of accountability. While focusing on NSVs is both important and necessary, neither NSVs nor scale readouts can be the only measure of progress for me. I need to balance them both. Right now, I am what I'd call a healthy level of obsessed about numbers - until I reach my long-term goal (and even then, I'd say), they matter a lot. Even as measuring my body's weight becomes less of a daily priority, measuring my food will still be something I need to keep up. The changes I have made and will continue to make until I reach my goal won't end when I "cross the finish line." The best advice I've gleaned from maintenance bloggers is on how to prepare yourself mentally for life at-goal, the biggest hurdle of which seems to be accepting the truth that there is no finish line. This small digital one was on sale, so I got it. About 6 and half pound capacity, measures in both grams and ounces. I have a hard time estimating calories with things that don't have nutrition information printed on them - namely fruits and vegetables, and meat. Underestimating by a few calories here and there can add up. Example: yesterday morning's breakfast was my standard breakfast these days, yogurt and a banana. That seemed right to me. This morning, though, same breakfast, except I weighed the banana - which I believe was about the same size as the one yesterday. That's a pretty significant difference! 40 calories here isn't fatal, per se, but 40 unaccounted-for breakfast calories for a year adds up to over four pounds. And if I'm underestimating here, odds are my other estimates are off, too. A lot of little things can quickly become a big thing. It's a basic kitchen tool, but still, I'm really thrilled about this investment! What about you? Do you use a food scale to weigh your meals? I agree a kitchen scale is the best investment for someone who is trying to lose or maintain weight. I use mine daily and weigh a good portion of what I eat. Sometimes I'm surprised that weighing will give me more than what a counted out serving size says. But most of the time a counted out serving size is much more than a weighed serving size. Have you watched Forks over Knives yet? It's out on Netflix now. Watching that has shed some light on why I've always failed at on any diet. The fiber in whole plant foods is leaving me stuffed long before I've eaten the too many calories. I weigh meat and cheese and things that are calorically dense, like nuts. It's surprising how small 3 ounces of meat is, or 1 ounce of cheese or 100 calories worth of nuts. The scale is so easy to use, I expect I'll be using it (or another) for the rest of my life. I can't trust myself to not inflate portion sizes. Good buy! I weigh just about everything that goes in my mouth, some foods like a banana or an apple I don't but everything else I do weigh and portion out, keeps my portions in check and keeps me from over eating. Plus help with logging my food. I do sometimes, especially meat. I have no concept of how much a serving of meat is. I've read that it's about the size of a deck of cards, but the last time I saw a deck of cards I was at a casino and drunk, so my frame of reference is unreliable at best. I like the scale. It's also helpful in recipes that use measurements in ounces instead of cups, like many of Alton Brown's recipes. I weight most things! A great tool. I think food scales are CRUCIAL to counting calories correctly. I used mine several times a day when I was losing weight, and I *still* have a hard time estimating just how much I'm eating without weighing it out. I had seen a video on another person's blog about how much of a difference there was in calories with measuring using a cup/teaspoon type measure versus using a scale and I searched until I found it. I don't know if you've seen it or not, but I'm going to try to post the link here. Very eye opening. I do not. But after reading this post I am considering it. we have a food scale and i LOVE LOVE LOVE it - especially when a serving is: 55g (approx. 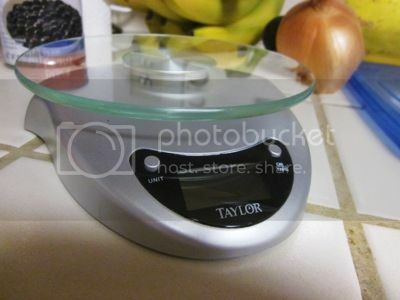 1/4 c) - I find that when I weigh my food, it's SO much more accurate than just a measuring cup. LOVE!!!! Interesting post. I have a food scale but it's not digital. I wonder if there's a huge difference. I totally get the whole 40 cal here and there -- it does make a difference in the course of a year. Especially for us shorties. I don't but after reading your post and everyone's comment I'm thinking maybe I should. Food is what I'm struggling with (as you know, btw really appreciate the comment) so maybe this will be another great tool in my arsenal. I do weigh a lot of our food. There is no way I can eyeball things like meat and potatoes which we eat sparingly. I weigh chips and cereal for my husband and sunflower seeds for me. It's kind of like the microwave in that I don't think about using it until it is not available. All in all, I think my food scale is one of my best investments. I use a food scale, but it's not a good one and not very accurate. This blog has inspired me to go get a digital one and start measuring everything again! Thank You! I don't weigh my food or count my calories. I know I will never be able to keep it up all my life so I decided against it and now just try and make good choices as much as I can. There will be days when I eat too much and days where I don't eat enough but I hope over time it balances itself out. I started using my food scale 2 years ago. I weight and measure everything. It's the easiest way for me to know exactly how much I am eating. I do think it can be kept up for a life time. Now my Hubby also uses one for all his meals. I am down 52 pounds and he is down 34. Food scale are great tools for weight watchers. This is helpful for those who has their food journals. You will be surprise of how much calories for different grams/ ounces. That's quite the difference. Perhaps getting one would be an investment I should make. Now that I started counting calories along w/ WW points, I'm starting get a better understanding of portions. No, I don't have a food scale, but after reading this post I'll be getting one! Thanks for the info.! I've owned 2 scales in the last 5 years. The first one was damaged while moving. I bought this exact scale last July. I use it everyday. I had to replace the battery in January so it looks like it lasts a good 6 months. It has been so reliable. I'll never regret the purchase. I weigh food at least a dozen times a day so I really put it to work. I've used a food scale for so long now I can't imagine not having one. I really liked what you had to say about coming to truths that there isn't a finish line. I've been thinking about that alot and how daunting a task it seems to be to convince myself not only that this is forever, but that it's ok that it's forever.